This is the Norfolk Broads' last working eel set, which is jointly owned by the Broads Society. The eels are nowadays caught only for the purpose of being counted. They no longer end up on the fish market. The Broads' last eel catcher was Derek Johnson, who died in October 2012, aged 85 years. He lived in Fleggburgh, in a bungalow that he had built for himself, and would go to Candle Dyke to lay his nets every evening between 7pm and 9pm, depending on the tide and the weather, and retrieve his catch at about 6am in the morning. 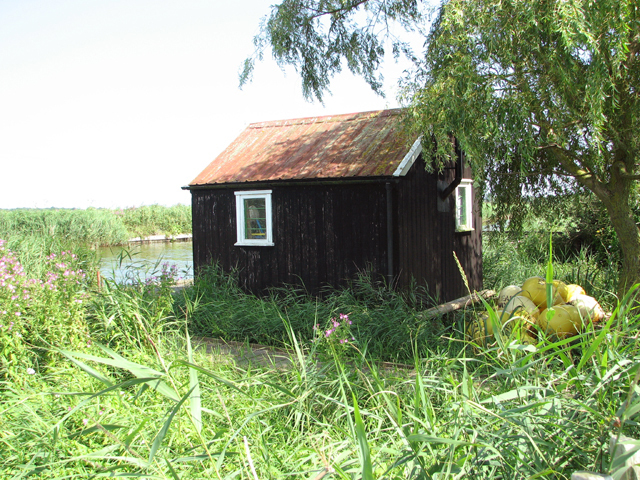 During the spring tide he used to work along the River Thurne before the fishermen arrived and during the summer he spent some time working on the Bure. During his heyday, Derek used to operate about 100 sets but in the later years there were only about 40. The eels were stored in large black dustbins in his dory or tied to a quay in a net when off to catch more. After the job was done, the catch would be taken back to Derek's home to be stored alive until their collection by the mobile eel buyer. Eel fishing always stopped in November when mature eels began their run to the sea.